Intermittent Fasting Meal Ideas: What to Eat for Weight Loss? This is an extremely important question that will determine the success of your program. First, your intermittent fasting goal will plan a role in this decision. My goal was weight loss and maintaining my health at the same time. I had no other specific medical conditions or goals (though having over 100 pounds to lose is surely a medical condition in itself). If you are fasting to relieve a certain condition, you may need to tweak your meal plan. 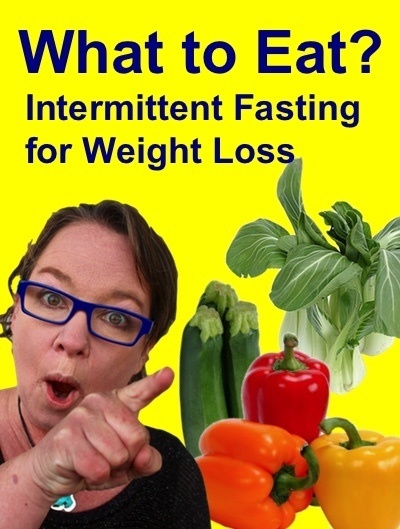 If you are fasting to lose weight, some of my experience may be useful to you. I have been able to stay on the diet for 18 months (and counting) with this approach. I find it do-able and flexible. I have traveled and lost weight. I have celebrated the holidays away from home and lost weight. I do so by sticking to these rules. Go low carb. Go “keto.” Go with your favorite low-carb plan. Eat a whole lot of vegetables. Watch the calories and you will lose weight faster. A large coleslaw with a homemade very low carb dressing (dressing recipe here) and a healthy protein such as boiled eggs, tuna, salmon, carne asada, and meatballs. A large romaine-based salad with an oil and vinegar-based dressing and a healthy protein topper. An Asian-seasoned meat over shirataki noodles with a large side of vegetables. I’ll work on building out some specific recipes for you guys on the Eat Like A Bear! website. Simple carbohydrates are metabolized like the sugars found in a cola. These sugars fuel your body but provide no nourishment. As long as you are fueling it with a cola or candy, it will have no reason whatsoever to burn it off your tail. In fact, it might store some more for you, just in case a famine is about to strike. The winning strategy is to deprive your body of this sugar, being mindful of your calorie intake at the same time, and it will have no choice but to burn fat. Your body moves into a fat-burning mode (ketosis) when it doesn’t have sugar to burn. I was in this fat-burning mode for months. In my most intense weight loss phase, I lost 100 pounds in 8 months. In those months, I did not eat anything high in carbohydrates that might bump me out of it. There was a time or two at a restaurant in which I might have had more than my limit of 20 net carbs but I moved on and stayed strict otherwise and had a lot of success. If you are a carb-eater and you are just getting started, you are going to need a transition as you lower the carbs and reel in the number of hours in a day in which you spread out your food (the intermittent fasting aspect). The carbohydrate aspect is a painful job in itself. To win the long game, you need to get to the place where you don’t consider consuming soda, bread, French fries, and all of the other carb-rich stuff that tempts us daily. You need to be so low carbohydrates that you are avoiding the carrots on your plate and using fewer onions in your dishes. So what on earth will you eat? It would be hard for me to overstate the amount of vegetables I ate, one hour at a time, in my year of intensive weight loss. My go-to has been what we now call “the big salad” in the Eat Like A Bear group on Facebook. I fill a giant stainless steel bowl with my greens. The bowl is probably about two quarts — it’s very big. I might fill it up with romaine and a homemade dressing (olive oil, vinegar, salt, pepper) and I eat the entire thing. I put a protein on top: meatloaf, salmon, meatballs, sardines, eggs. The salad is very healthy and digests for hours. In fact, I feel fuller than I’ve felt in my entire life after eating a meal like this. I feel satisfied and I have energy. It works well for me and it is worth you giving it a try. I also eat vegetables over shirataki noodles, in soups, and in sandwiches. I talk about more models of my meals in the Eat Like A Bear! book. There is a misconception in the keto dieting world that calories do not matter. What matters is that you are in ketosis. The fact is that whatever you eat in terms of calories, you will have to burn them off before your body turns to your bottom fat or your tummy fat. You might burn those calories more efficiently eating this way. It seems as though I did. However, you still need to burn through them. Don’t eat a mountain of keto fat bomb candies if you need intensive weight loss. Stick with the salads and the shirataki noodles. 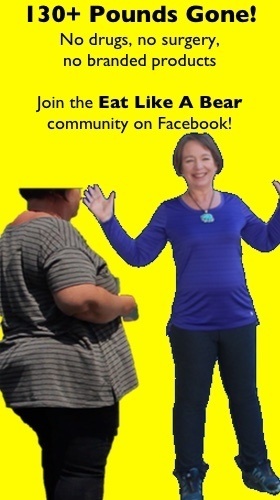 I describe this issue in more detail: the keto diet for weight loss. I also discuss food and meal issues in the book: Eat Like A Bear! The Blueprint. Best of luck to you in meeting your goals!